Just got a call from my account team asking me if there’s a way to create a report in Analytics that combines multiple views into one. Initially, I thought of auto-emailing multiple reports, but it’s a hassle: we track 7 different Flash events for 7 brands, so imagine creating 1 summary report plus 7 brand reports and emailing those 8 files to someone on the team who would most likely need to re-jiggle the data into one big summary. 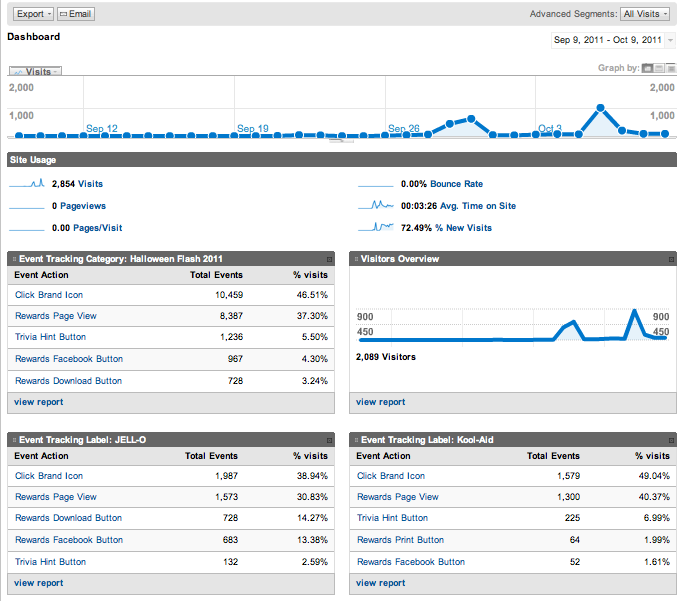 Turns out Google Analytics allows for a super efficient cool way to do this: put all reports into the Dashboard! How to do this: when you are viewing the report that you’d like to see regularly, click on the Dashboard icon at the top (next to Export and Email icons). This will move this report to the Dashboard. Once you’re done, go back to the main screen (that is the Dashboard) and re-arrange your reports however you like. Another helpful hint: you can then schedule your Dashboard report to be emailed to you as a PDF file (daily or every Monday). With the old Google Analytics now end of life’d, this problem resurfaces. Have you found any new solution? I really hope they bring this feature back.